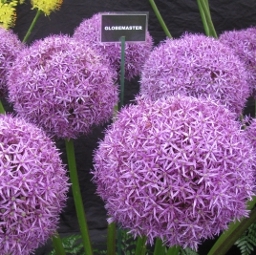 Generally alliums prefer good drainage and a sunny aspect. The smaller types are most suitable for the rockery, whilst the larger forms are better planted in borders and look especially attractive planted in a clump. The planting depth of the bulbs vary from say 5cm for the smaller tuft forming plants to some 10cm for the larger decorative forms. Very large heads up to 10cm across of rich deep-violet flowers on stiff stems up to 90cm tall give a stunning display in May-June. Best in a large rockery, border or island bed. 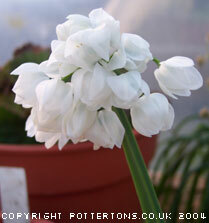 Recent introduction with relatively large heads of white flowers each with purple stamens on 35cm stems. A lovely addition to our range. Small dense umbels on slender stems up to 35cm of deep sky-blue flowers in June/July. Native to Turkestan. Many umbels of purple-pink flowers, occasionally white on stems to 40cm in autumn. 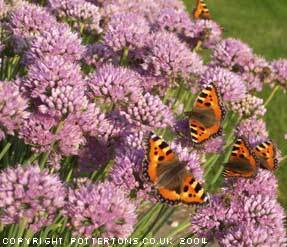 Good late flowering period, our plants always attract great numbers of bees & butterflies during their long flowering period. Beautiful rose-pink pendulous umbels on 30cm stems in June/July, an easy reliable plant for border or alpine bed. Large, star-shaped lilac flower heads up to 20cm across on stems up to 40cm tall in May - June. Enjoys well drained soil in a sunny border, island bed or rockery. 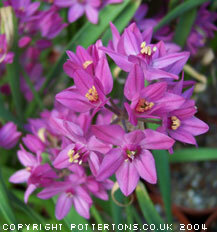 A fine dwarf species with deep wine coloured bell-shaped flowers on stems to 20cm, can seed freely around the mother bulbs but not so to become invasive. Suitable for scree, trough or raised bed. Native of Kansu, China. Huge dense heads of deep purple flowers up to 20cm across on stiff, stout stems 75cm tall - an unbelievable sight. 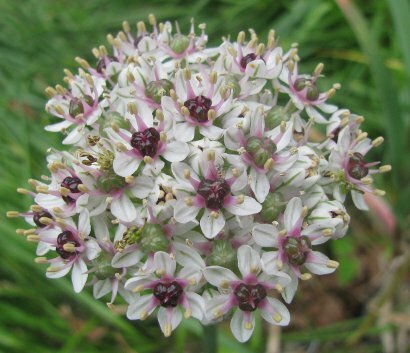 Very attractive flowers of white, shaded rosy-violet in very large umbels measuring to 20cm across, on stems just 15-20cm tall in May to early June. Wide metallic-blue shiny leaves. A superb ornamental species for border planting. 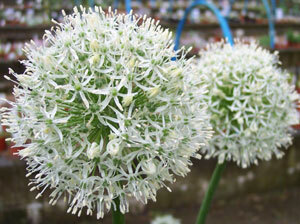 Very attractive and impressive large heads of pure white flowers on stems to 100cm tall in May-June. 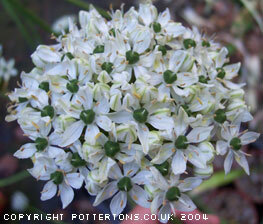 Round, tight heads of creamy-white flowers with yellow anthers & black ovaries on strong, stiff stems to 60cm in May-June. Tolerates soils with a high lime content. Beautiful dwarf plant with large round umbels of many carmine-red flowers on short stems to 10cm high in June. For scree, raised bed or large trough. A striking recent introduction with large globe heads of dark purple-red flowers on relatively short stems, up to 40cm tall, outstanding in garden. Dwarf plant with umbels of relatively large pure white flowers on stems to 20cm in March-April. Very large umbels of violet flowers on stiff stems to 80cm in May/June. Compact tufts of narrow leaves and umbels of pretty pink flowers on 20cm stems in profusion. A beautiful plant, flowering in summer that always attracts many butterflies and bees. A stunning NEW garden hybrid with large heads of many small white flowers that each has a plum-red centre, on stout 70cm stems. Intense reddish-purple tight umbels on stems to 45cm in July-August. 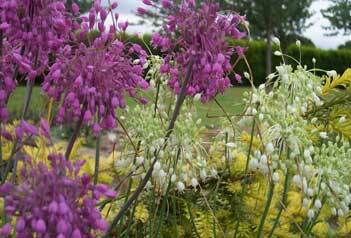 Most attractive when planted en masse in a garden border or island bed. 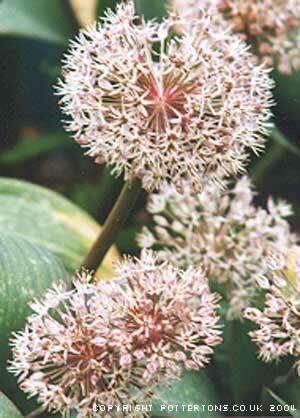 Another ideal Allium to attract butterflies and bees.